The two taillights tell the tale. The rear of the 1972 Datsun 510 is unpretentious, the color of an artificial limb, with two slight rectangular taillights borrowed from a Lada 1600. In contrast, the backside of the 2016 Maxima is a bouquet of bulges and creases, with lights whose stylish amber fingers reach aspirationally toward the front of the car. (Every taillight wants to be a headlight, you know?) They function almost as an afterthought, like a Chihuly that, you one day discover, can spit coffee from one of its spirals. 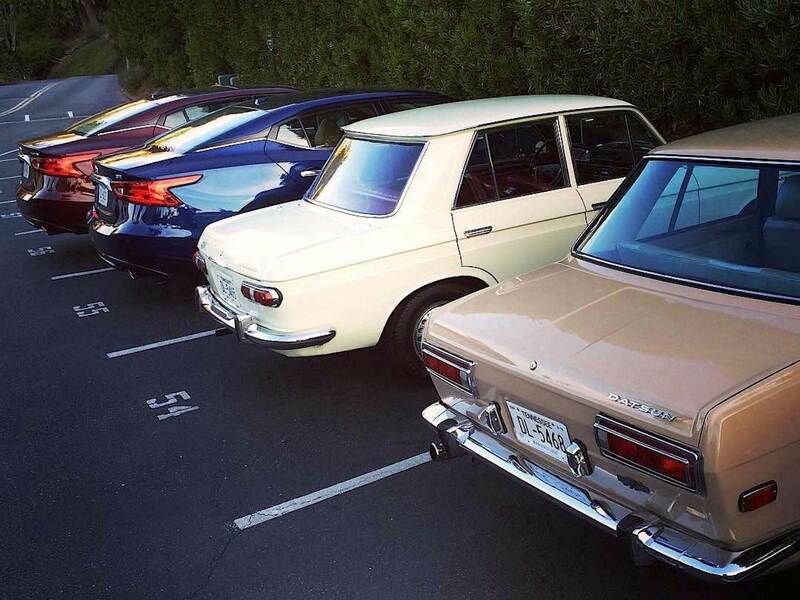 Where one car runs, the other sashays; while the Datsun has four gears, the Nissan has infinity. From a row-your-own stick shift to an ever-whirring, continuously-variable transmission. That’s progress. The question: Which is more lovable? Nissan yanked a bone-stock Datsun 510 out of hibernation at the Lane Auto Museum, pulled a brand new Maxima SR from the fleet, and gave us a chance to find out. In one corner, the charming bantamweight. When it was released in 1968, the 510 introduced Datsun as a mainstream brand, offering the economy-minded public an inexpensive car that still provided joy. That meant inoffensive lines (the Lada comparison works from tip to tail) draped over a sophisticated chassis. 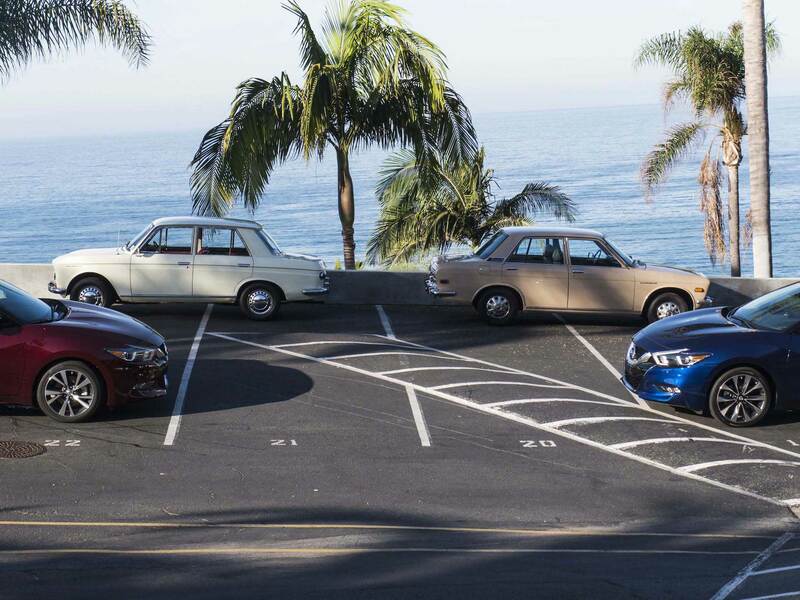 Mechanically, Datsun cribbed from BMW’s 1600: independent rear suspension, front disc-brakes, and a 1.6-liter engine with just under 100 horsepower. Especially in Prosthesis Beige, the Datsun has all the visual verve of a Soviet housing block. The only two indulgences are 13-inch chrome hubcaps and bumpers so dainty they could be functionally replaced with sundae spoons. The doors open with a pinky pull. Unlike period Germans cockpits (legend holds that the vent knobs on a Mercedes 280SE are sturdy enough to be used as bullets), most of the 510’s dashboard seems brittle and toy-quality. The plastic glove-box door is wafer thin; the round dashboard vents have all but given up, metallic faces gazing downward, ashamed at their flimsiness. All mechanical pieces, though, are immensely satisfying, if not super accurate. The steering wheel and foot-and-a-half long shift lever buzz and jump, and the clutch engages with a pleasant crunch—imagine stepping on a scoop of Raisin Bran. It’s not soothing, and never boring. After a few hours on the freeway at a this-is-fine-but-don’t-push 72 mph, we turned onto California’s beautifully tortured Highway. Traffic and steep hills were a perfect foil for the 510: Low speeds, lots of shifting, comprehensive ocean views framed by toothpick-thin pillars. Just a few miles inland, at Laguna Seca, the famed BRE 510 beat out Alfa Romeo to give Datsun its first Trans-Am championship. The victory secured this car’s status as a sports sedan with race-ready bones. Forty-four years later, winding down the California coast with an unburned-hydrocarbon headache still feels right. If Route 1 is the perfect playground for a Datsun, it’s too old a road for a car as big and fast as the Maxima. It’s a tiny stage for a plus-size hoofer. Sorry. The Maxima cries out for metaphors. It is a pompadour with a 300-horsepower V-6. It is a tri-tiered wedding cake with a CVT. It is a wheeled length of glitter glue extruded through a pastry bag with a florid tip. (Sorry, really.) Hooded eyes. Bulging hips. Weapons-grade prow. Where the Datsun’s design is understated to a fault, the Nissan’s is forever shouting slightly sexual things at high volume. You might feel inappropriate driving the car to a funeral, or past an elementary school at recess. The interior offers a respite. The controls are canted towards the driver, and the eight-inch touchscreen is bright and responsive. Seats are enveloping and sport a Bentley-esque diamond-quilted pattern. Touchwise, there’s an Oklahoma pasture’s worth of stitched leather—from binnacle back—and the flat-bottomed steering wheel has Alcantara inserts to complement its pseudo-sports car shape. Infiniti’s upmarket shapes and upholstery, successfully aped. The Maxima cries out for metaphors. On the road, the Maxima is quick, if a bit dull. All the qualities that big sedan buyers love—quietness at speed, solidity, and fuel efficiency—diminish the enthusiast appeal. The Bose noise cancellation system demands a piped-in engine note, which sounds fruity and, well, fake. Engine? Powerful, but the CVT, even with faux gears, makes acceleration unnerving. (If a regular transmission allows the engine to crescendo, a CVT traps motors in a one-note samba.) The suspension is a high point: pliant, even on 19-inch wheels, keeping the large body from leaning too far and showing its bloomers. Competent, but removed. Of course, the Maxima is a mainstream sedan, not a sports car. But it’s missing that pinch of joy that made Datsun a racing champion and lodestar for young drivers. Today, Nissan sells five million cars annually and, as it has aged, customers have, too. Ostensibly sporting 55-year-olds will be well-served by the Maxima—it’s comfortable, quick, and solid. But where is a young enthusiast to turn? The GT-R is wickedly potent, but conceptually and physically distant from the lighter joys of a 510. It also costs $100,000. The 370Z, successor to an icon, is almost a decade old and outclassed by the competition, all for $30,000 plus. The immense pleasures of the Datsun 510, its indomitable spirit and deft handling, were available to any young buck with a decent job in the Sixties. Hell, at an inflation-adjusted $13,000, they’d even money left over for upgrades. Today, where would that same buck’s daughter go for an equivalent experience? The dealership a couple of blocks down, for a Mazda 6. Progress is kinder to some than others.